The Hon Victor Dominello at ICC Sydney Art Collection Book launch. International Convention Centre Sydney (ICC Sydney) celebrated last night with the launch of a limited edition commemorative book, ICC Sydney Art Collection: A Curated Collection of Art to Celebrate Sydney, as one of the world’s most prestigious venue collections was reintroduced to the Sydney community. Displayed across the convention centre’s main theatre foyer spaces, to highlight their importance and create a gallery-like experience, as well as across the Darling Harbour precinct, the collection of more than 30 local and international works that celebrate Sydney, its harbour and its magnificent foreshores is one of the most significant of any convention venue . The impressive collection includes major pieces from Brett Whiteley, John Olsen, Sandra Leveson, Lloyd Rees and Tim Storrier, alongside key works from esteemed Aboriginal artists such as Gloria Tamerre Petyarre and Long Jack Phillipus Tjakamarra, highlighting the significance of Australia’s Aboriginal and Torres Strait Islander heritage to the venue. The cultural inspiration extends into the public domain, where a raft of artworks pay homage to Sydney and showcase changing interpretations of Australia’s culture and history. Here, recent public commissions include Habitat from Janet Laurence, Entelekheia from Danie Mellor, and data.scape by international electronic composer and visual artist, Ryoji Ikeda. CEO of ICC Sydney, Geoff Donaghy, said the venue is proud to be the custodian of such a dynamic range of artwork, which reflects its place within the broader cultural fabric of the city. “While the collection is varied and includes both prized works commissioned for the first convention and exhibition centre in Darling Harbour and key contemporary additions, the thread which pulls all of them together comes from the cultural life of Sydney, where artists have responded in some way to the city, its harbour and its foreshores. 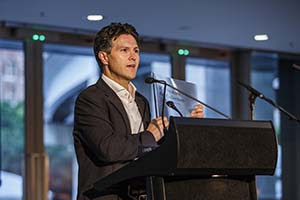 NSW Minister for Finance, Services and Property, Victor Dominello, who officially launched the book, said that in just 12 months ICC Sydney has enriched the city’s offering and underscores Sydney’s reputation as one of the most desirable destinations in the world. The ICC Sydney Art Collection book has been created to share with clients to thank them for their business. It includes an overview of the artworks on display alongside information on public art pieces within the broader Darling Harbour precinct. It also provides an insight into the unique history of ICC Sydney’s art collection, the majority of which was obtained in 1988 during the first major redevelopment of Darling Harbour and Australia’s bicentennial year. A warm welcome by Des Madden from the Cadigal clan, one of 29 clans that make up the Eora Nation, has also been extended within the book.